Provincia Antartica Chilena is the most southerly province of Magallanes Region. Part of this Province includes the Islands of the extreme South of South America, reaching Cape Horn and Diego Ramirez Islands but the largest portion of Chilean Antarctic Province is located in the Antarctic Continent, on the area claimed by Chile between Meridians 53° and 90° West of Greenwich and from parallel 60° down to the South Pole. Its capital is Puerto Williams, village and Naval Station with 3,000 inhabitants in Navarino Island, South from Tierra del Fuego. The civilian population of Puerto Williams mostly lives from fishing industry, tourism and an incipient industrialization thanks to the creation of recent investment laws. To get here there are daily flights and weekly ferry departures from Punta Arenas. The Beagle Channel separates Navarino Island from Tierra del Fuego, named Beagle in honour of the sail ship commanded by Robert Fitz Roy, first Europen to land here in 1830, who explored and baptized the islands and channels with the name of his officers. Further South, beyond the Cape Horn and Sea of Drake lies the rest of the Province, on the Antarctic Territory, whose main population center is Villa las Estrellas, next to Presidente Frei Station in Isla Rey Jorge (King George Island). Club de Yates (Puerto Williams' Yacht Club) : Meeting point for navigators from all over the World that sail through the Cape Horn, the southernmost and feared of the great capes. It is a natural terrace connected to the stranded cargo ship "Micalvi" where there is a cozy Nautical Club as well. "Martín Gusinde" Museum", The southernmost in the World, founded in 1975. Its name remembers the eminent German ethnologist and priest who worked with the "Yaganes" and "Selknam" indians between 1918 and 1924. Thorough historical synthesis about the extinct natives of the area along with an exhibit of the natural resources, flora and fauna. Navigation across the Glaciers of the Darwin Mountain Range : Seascapes considered among the most beautiful all over the planet. Voyage through the Beagle Channel admiring the majestic gallery of glaciers on the southern shore of Tierra del Fuego island: España, Romanche, Alemania, Italia, Francia, Holanda, Garibaldi, Pia, etc. where it is possible to disembark, sailing kayak or going deep into the thick virgin forests. Plenty of bird and sea fauna. Ukika Village : 2 Km. away from Puerto Williams. Reservation where inhabit the last descendants of the Yagan or Yamana race dedicated to fishing and craftsmanship. Moved here decades ago by the Chilean Navy from the places where they were scattered. Omora Ethno-Botanical Park : In Caleta Robalo, 5 Km. from Puerto Williams was created this Research and Conservation Center called Omora in Yagan language (Hummingbird in English). It is a natural space where the ancient Yagan culture mix with the environment especially rich in flora of many native species. Cerro La Bandera : (Trekking circuit across La Bandera Hill) : Round trip of about 4 hrs. departing from Puerto Williams to Cascada La Virgen, 3 Km away. The climb begins in a wooded, winding, but clearly delineated path finally reaching a height of 610 mts. where the view is wonderful. The circuit can continue up to the higher summit to the South getting an even more spectacular view of the Beagle Channel and surroundings. Dientes de Navarino Trekking Circuit : The World's southernmost. 53 Km. long, about 5 days starting from Puerto Williams touring the largest range of mountains of the island. Rocky peaks of more than 1,000 mts. also recommended for the practice of climbing. The view on the southernmost inhabited areas of Chile and Argentina is magnificent. This circuit forms part of El Sendero de Chile (Chile's Path) that will link all the national territory from top to bottom. 63,093 Hs. protected area S. from Navarino Island, made up by the group of islands Wollaston and Hermite in the south extreme of the American Continent. Access by sea from Punta Arenas, Puerto Williams or Ushuaia in Argentina. Cape Horn represents one of the major challenges for the navigators of all the Nations since it marks the south border of South America and where the waters of the Pacific and Atlantic Oceans converge giving rise to the fearsome Drake Passage. Throughout the years, a large number of shipwrecks have occurred around the Cape's coastline. In November 1992, on the 500th. 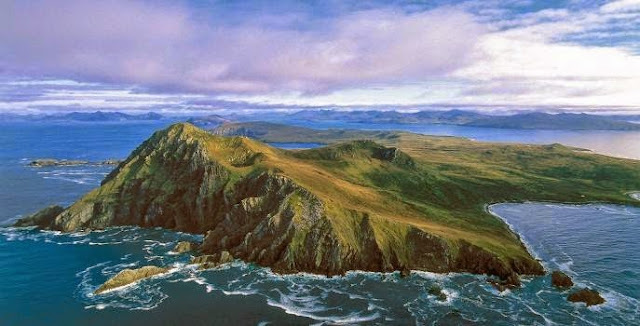 anniversary of the discovery of America here was raised the Monument Cape Horn, an albatross in full-flight over the hill indicating the maritime pass in commemoration of all the expeditionaries coming from the seven seas that have succumbed in the attempt to cross it. From its beginning until today, Tourism to Antarctica has registered a constant growth, reaching almost 40,000 visitors a year. 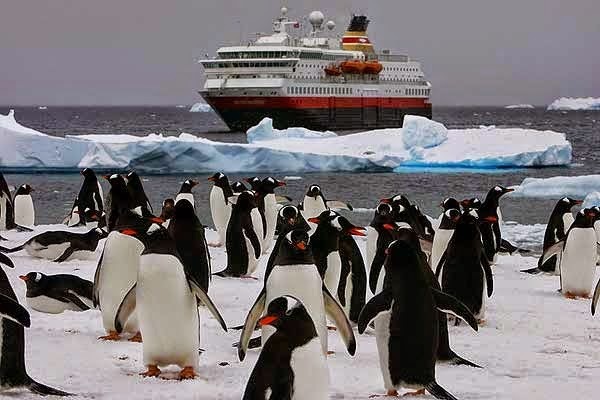 The IAATO (International Association of Antarctica Tour Operators) is the entity that administers the private tourism companies operating to the Antarctic Continent, making travels an environmentally responsible activity. But, how to get to the White Continent from Chile? There are specialized companies that schedule their cruises and flights well in advance. The tourist season is from November to March, during the southern hemisphere's spring/summer months. Depending on the travel mode and programs, the places to visit are among others: Presidente Frei Station and Villa las Estrellas at Isla Rey Jorge (King George Island, the largest of the South Shetlands archipelago), Geographic South Pole flights, Union Glacier Camp, navigation around the shores of the Antarctic Peninsula, visiting the majestic landscapes of Paradise Bay, Lemaire Channel, Petermann Island next to the Polar Circle, visit to different Scientific Resarch Centers and International Stations, etc. In the Earth's largest Natural Reserve are also attactions its huge Icebergs, the rich marine fauna like large Penguin and Cormorant colonies, the beautiful Albatross, Petrels, Blue Whales, Orcas, Marine Elephants, Weddell Seals, etc., to marvel at the midnight Sun and enjoying the landscape of the Continent of the future, whose area of 14 million km2. holds huge treasures of natural resources, among others, the seventy percent of the Earth's fresh water reserve.